Events in Afghanistan have a crit­i­cal impact on India’s Inter­nal Secu­ri­ty because as Robert Gates, for­mer Direc­tor CIA and then US Defense Sec­re­tary, said some years ago, “22 per cent of all ter­ror­ists oper­at­ing in Jam­mu and Kash­mir were either from Afghanistan or had been trained there”. The writer, one of India’s fore­most experts on Afghanistan and a for­mer DGMI, car­ries out an inci­sive analy­sis of Pakistan’s role in Afghanistan — espe­cial­ly the spoil­er dimen­sion that pro­vides sanc­tu­ary sup­port to the Haqqani, Quet­ta and Hek­mat­yar Shooras and has recent­ly tor­pe­doed the peace talks between the Karzai gov­ern­ment and the Tal­iban. In get­ting Rab­bani killed and tar­get­ing the US embassy in Kab­ul has Pak­istan over­reached itself? The geo-polit­i­cal per­cep­tions of Pak­istan in Afghanistan should be exam­ined in the light of Pakistan’s per­sis­tent efforts for estab­lish­ing a pli­able and sub­servient regime in Afghanistan. Pak­istan has been advo­cat­ing the neces­si­ty of strate­gic depth in Afghanistan to mask its ter­ri­to­r­i­al ambi­tions and its aim of expand­ing its strate­gic fron­tiers towards West and Cen­tral Asian regions. Secure west­ern bor­ders and a sub­servient Afghanistan will enable Pak­istan to deploy most of its armed forces against India. Pakistan’s pol­i­cy of gain­ing strate­gic space in Afghanistan is not new but prob­a­bly is direct­ly relat­ed to their ambi­tion for carv­ing out a larg­er Islam­ic enti­ty in the South Asian region joint­ly with the glob­al Islam­ic jihad move­ment, to emerge as a dom­i­nant pow­er in South Asia. Pak­istan military’s unwar­rant­ed con­cerns about the Afghan army devel­op­ing a poten­tial to take on Pak­istan comes in the con­text of India’s increas­ing influ­ence in Afghanistan. To counter this Pak­istan obvi­ous­ly wants Afghanistan ruled by a rad­i­cal Islam­ic group over which it has sig­nif­i­cant influ­ence and that would give no quar­ter to India. Pak­istani mil­i­tary presents India as the prime adver­sary and a per­sis­tent long-term ene­my and it has been con­stant­ly mak­ing efforts to con­vince Wash­ing­ton that Pakistan’s strate­gic needs must be met in Afghanistan. This means keep­ing Afghanistan firm­ly in Pak grip by exploit­ing reli­gious affil­i­a­tions. Their inter­ests in Afghanistan are pri­mar­i­ly linked to the Indo-Pak­istani con­flict. Accord­ing­ly, it has man­aged to turn almost every oth­er dimen­sion of its region­al pol­i­cy — such as its dis­pute with Afghanistan regard­ing the bor­der issue and Pash­tunistan and its deal­ing with Cen­tral Asia and the Unit­ed States — into a zero-sum game with India. Pre­vent­ing a dom­i­nant Indi­an influ­ence in Afghanistan, which could evolve into an alliance between the two coun­tries and trap Pak­istan in a two-front sit­u­a­tion, is Islamabad’s first objec­tive. Para­noia feeds its strate­gic out­look, hence the float­ing accu­sa­tions of ter­ror­ism and sab­o­tage, con­spir­a­cy the­o­ries regard­ing Indi­an con­sulates in Afghanistan and alle­ga­tion of Indi­an sup­port for the Baloch and Wazir insur­gen­cies. A sta­ble, friend­ly and coop­er­a­tive Afghanistan, in the eyes of Pak­istan, is nec­es­sar­i­ly an Afghanistan under close Pak­istani con­trol, denied all pos­si­bil­i­ties of direct trade with India. The Pash­tun ques­tion is an issue in its own right and reflects to a large extent Pakistan’s iden­ti­ty relat­ed inse­cu­ri­ties. It con­cerns both Afghanistan’s irre­den­tist claim on the ter­ri­to­ries locat­ed between the for­mer Durand Line and the Indus Riv­er as well as to the deep-root­ed sus­pi­cion of extra-ter­ri­to­r­i­al affil­i­a­tions of the Pak­istani Pash­tuns. It is also an eco­nom­ic prob­lem for Pak­istan, as smug­gling across an unrecog­nised bor­der deprives the Pak­istani state of bil­lions of rupees every year. Islam­abad fears Pash­tun irre­den­tism and Afghan claims over the ter­ri­to­ries between the Pak-Afghan bor­der and the Indus Riv­er. This explains the con­stant fight between the two coun­tries over the demar­ca­tion of the bor­der. In addi­tion to pre­vent­ing Indi­an influ­ence in Afghanistan, secur­ing US and inter­na­tion­al sup­port against India, even if indi­rect­ly, is also one of Pakistan’s key inter­ests in Afghanistan. Pak­istan has nev­er been able to secure the long-term alliance against India it desires. In recent his­to­ry, it has only gar­nered US com­mit­ments to its secu­ri­ty on an ad hoc basis. The Sovi­et inva­sion of Afghanistan was one such occa­sion. The “war on ter­ror” against the Tal­iban in Afghanistan and against Al Qae­da in Pak­istan pre­sent­ed a sim­i­lar oppor­tu­ni­ty. The US pres­ence in Afghanistan and its mil­i­tary sup­port to Pak­istan are seen as parts of the same equa­tion. The for­mer is seen as a guar­an­tee against dom­i­nant Indi­an influ­ence in Afghanistan, the lat­ter as a way of strength­en­ing the Pak­istani forces against India. Hence the US$ 8 bil­lion Pak­istan spent on con­ven­tion­al equip­ment for its army and air force, tak­en from the US$ 15 bil­lion the coun­try received from the Unit­ed States osten­si­bly as a reim­burse­ment of its expens­es in the war on ter­ror. Post Abbot­tabad, US atti­tude towards such grants has how­ev­er dras­ti­cal­ly changed. Cen­tral Asia is viewed through the same prism of Indo-Pak­istani rela­tions, albeit to a less­er degree. As a poten­tial alter­na­tive sup­ply route to Pak­istan, the Cen­tral Asian Republics, in par­tic­u­lar Tajik­istan and Uzbek­istan are seen as a threat — not to Pak­istan but to Pakistan’s cen­tral­i­ty in the Afghan con­flict. An alter­na­tive sup­ply route would like­ly dimin­ish US and inter­na­tion­al depen­den­cy on Islam­abad and, indi­rect­ly, on Islamabad’s over­all Afghan pol­i­cy, mak­ing the Unit­ed States less like­ly to accept Pakistan’s demands and there­fore ben­e­fit­ing India. The refugee issue is only of sec­ondary impor­tance to Pak­istan. As of March 2009, 1.7 mil­lion reg­is­tered Afghan refugees were still liv­ing in Pak­istan, where they are also allowed to work and attend school. These refugees are a drain on the country’s scarce finan­cial resources. Only a peace­ful and rel­a­tive­ly sta­ble Afghanistan would allow their return to their home­land. These inter­ests are some­times con­tra­dic­to­ry but do con­sti­tute the back­ground against which Pakistan’s Afghan’s pol­i­cy is for­mu­lat­ed. Pak­istan has posi­tioned itself in sup­port of US and inter­na­tion­al objec­tives and on Sep­tem­ber 12, 2001, it offi­cial­ly announced the end of its tra­di­tion­al sup­port for the Tal­iban. Since then the coun­try has pro­vid­ed some logis­ti­cal facil­i­ties to the Unit­ed States in the form of bases and lat­er to the North Atlantic Treaty Organ­i­sa­tion (NATO) in the form of tran­sit routes. In prac­tice, how­ev­er, Pak­istan pol­i­cy is more ambiva­lent and com­plex. On the one hand, it tru­ly sup­ports the fight against Al Qae­da and more gen­er­al­ly all groups it con­sid­ers a threat to its own inter­ests. But this list of antag­o­nis­tic groups peri­od­i­cal­ly changes. For exam­ple, the Tehrik-e-Tal­iban Pak­istan (TTP), which Pak­istan is cur­rent­ly fight­ing, was pre­vi­ous­ly one of its pro­teges until the TTP turned against the Pak­istani army fol­low­ing the cycle of attacks and reprisals gen­er­at­ed by the Red Mosque inci­dent. This pol­i­cy is not with­out costs for Pak­istan, both human and finan­cial. The bat­tles in the Bajaur dis­trict and the Swat Val­ley have gen­er­at­ed a flow of inter­nal­ly-dis­placed per­sons that Pak­istan has to man­age, plac­ing an addi­tion­al bur­den on an already weak econ­o­my increas­ing social ten­sions. How­ev­er, these costs are some­times seen in some quar­ters as the price to pay for the real­i­sa­tion of Pakistan’s larg­er objec­tives and are there­fore accept­able (even more so if they are paid for by the inter­na­tion­al com­mu­ni­ty). Pak­istan keeps sup­port­ing, train­ing and fund­ing a num­ber of ter­ror­ist groups in the pur­suit of its for­eign pol­i­cy objec­tives. Despite tremen­dous for­eign pres­sure, Pak­istan has done vir­tu­al­ly noth­ing against the Afghan Tal­iban move­ment present on its ter­ri­to­ry; the Quet­ta and Peshawar shooras still oper­ate from Pak­istani soil. A rel­a­tive­ly new phe­nom­e­non has also emerged in the Fed­er­al­ly Admin­is­tered Trib­al Areas, tra­di­tion­al­ly a launch­ing pad for jiha­di oper­a­tions in Afghanistan: the replace­ment of local jihadist organ­i­sa­tions by more exten­sive Pun­jabi ones, Lashkar-e-Toi­ba being the most promi­nent. Because of the post 9/11 effect of the flu­id­i­ty of jihadist affil­i­a­tions, it may not be fair to see the process as an oper­a­tion entire­ly staged by the Pak­istani army. The sim­i­lar­i­ty with the Pak­istani army’s strat­e­gy in Kash­mir, how­ev­er, is too strik­ing to be coin­ci­den­tal. The Pak­istani strat­e­gy in the area is high­ly selec­tive. Pak­istani offi­cials clear­ly indi­cate that they want to hit one spe­cif­ic tribe, the Mehsuds, from which the TTP orig­i­nates, in order to teach oth­er groups a les­son and keep them qui­et, on the basis of which they will con­clude peace agree­ments. They have also stat­ed that they will not touch any organ­i­sa­tion that does not tar­get the Pak­istani state. As a result, this pol­i­cy pro­tects, for exam­ple, Lashkar-e-Toi­ba a group with an inter­na­tion­al agen­da, as demon­strat­ed by the Headley affair, but always pre­sent­ed by the Pak­istani army and intel­li­gence agen­cies as a local organ­i­sa­tion. Inso­far as rec­on­cil­i­a­tion process is con­cerned Pak­istan wants a stran­gle­hold on this issue. 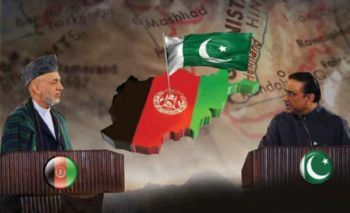 It has done its best to sab­o­tage any direct talks between Afghanistan gov­ern­ment and the Tal­iban. The most glar­ing has been the assas­si­na­tion of Burhanud­din Rab­bani, for­mer Pres­i­dent of Afghanistan is per­haps the last straw that broke the camel’s back as far as the peace talks are con­cerned. Cur­rent prob­lem post Osama and attack on their naval base is three fold. First, its rela­tions with Afghanistan con­tin­ue to dete­ri­o­rate. This is com­pli­cat­ed by a sec­ond prob­lem, its wors­en­ing rela­tions with the US. Then there is the third wor­ry of being out­paced and out­wit­ted by India in the days to come. Afghanistan accus­es Pak­istan of being behind cross bor­der attacks which have killed many in the bor­der regions. It also sus­pects the sup­port­ive hand of the ISI in Tal­iban led attacks in Afghan cities. All this, even as Islam­abad woos Karzai and urges him to work close­ly with Pak­istan. This is typ­i­cal of how Pak­istan oper­ates, says one observ­er. “The left hand does not know what the right hand is doing.” There is lit­tle that can be done to pro­duce a more coor­di­nat­ed pol­i­cy because of the dom­i­nant role ISI plays in rela­tions with Afghanistan.